My grandfather was a Cab man, generally speaking, but when he drank white wine, his go-to was always Chenin Blanc, a Loire Valley native that also goes by the aliases Vouvray, Agudelo, Pinau Gros, and Steen among others. And fittingly enough, it had fallen into fuddy-duddy grandpa-wine status until fairly recently. Now it has been officially “rediscovered” and is the darling of many a sommelier, so it is now officially a wine to know if you want to seem hip. Note: “Knowing” Chenin Blanc is a long-term deal. Chenin Blanc is a good candidate for “desert island” white wine in the sense that it’s got completely amazing versatility, and can produce clean, dry, light wines, botrytized dessert wines and everything in between. It can be still, sparkling, or pétillant, which is “slightly fizzy.” Some Chenins are very cellar-worthy, others are “drink it now.” It’s tolerant of skin-contact maceration, which increases phenolic complexity, and of malolactic fermentation, which softens its naturally zippy acidity. Though it is a French native, it is planted widely across South America, New Zealand, the US west coast, and perhaps most notably, South Africa-it’s the signature grape of the Cape region. Dry Chenin Blanc is often highly mineral in nature, and prominently (and pleasantly) acidic. Other commonly recognized notes are green plum, angelica and honey, and sometimes tropical fruit notes such as pineapple and even banana. Botrytized versions lead with honey and peach. In the middle range, depending where it came from and how it’s treated, you might find quince and pear, guava and, if oak barrel aging is involved, toast and vanilla traces (in some regions acacia barrels are favored; if used they will give the wine a much stronger yellow color). The wide range of styles for this grape make it a fun food-pairing wine; there’s a Chenin for almost everything (I’m not sure it stands up especially well to red meat but you might even disagree on that). Sweeter styles are in the “serve me with the spicy stuff” range; drier ones can be friends to creamy sauces, pates and other rich foods where the crisp acidity is a welcome foil. Disclosure: This is on the walk of shame list of “wines Amy has literally had for breakfast.” Nothing that isn’t special makes that list-when you’re on a wine tasting tour you can easily start your day early enough that the most dedicated wineheads will tend to spit stuff out because It’s Just Too Much. I’m saying, this stuff is special. Kiona is not a small operation; they farm a very large slice of the Red Mountain region and both make a lot of their own wine and sell a lot of grapes to a host of other winemakers. They make more than one style of Chenin but I’m singling this out because ice wines are just weird and nifty. I believe it is the most expensive Chenin Blanc from Red Mountain, which reflects the level of babysitting required to make a good one. Ice wines are the latest of late harvest wines, picked while frozen on the vine and processed while still frozen to maximize a concentrated extraction. The results can be quirky or cloying if there isn’t enough acid to give it structure but this is not an example of that, it’s brilliant. Golden, honeyed, with hints of pineapple (I also get pineapple guava) and a trace of dried apricot. Try it for breakfast? If you are not familiar with Chenin Blanc this one’s a super-approachable, entry-level iteration that says “quaffable” very loudly. I paired it with puttering in the garden on the first hot day of the season and was very contented with the situation. Fruity and quite dry, this wine isn’t the most complicated or nuanced Chenin in the world but it’s a generous one with strong notes of pear, apple, nectarine and a hint of something tropical (the label will tell you to expect passionfruit’ what I tasted was a little more like pineapple but hey). I had it a la carte, but I expect it’s pretty food-friendly. It’s friendly, just in general. A lovely, ripe-but-not-flabby dry Chenin with a peachy nose (hint of grapefruit or bitter orange); very neatly balanced sugar and acidity, kind of… sensual, actually. Like it’s round in all the right ways and well-defined in all the right ways. The finish is dry and persistent with a strong quince note that makes me think it’d be interesting to pair with some Manchego cheese. But by no means do you have to get that specific; drink this with whatever you like, including nothing. It stands on its own just fine. Champalou makes several Chenins, and both still and sparkling iterations are relatively easy to track down-it turns up on wine lists all over my neighborhood despite the large-looming presence of Napa and Sonoma an hour away. A classic Methode Traditionelle style bubbly, it has a pale gold tone, itsy-bitsy bubbles, and a lovely nose of almonds, cherry blossoms and linden. The palate is dry and has some gravitas to it, with traces of earth, pears, honey, and a little blood orange on the finish. A friend to food. Like, any food. Division is an urban (and urbane, I might add) winery in Portlandia; the fruit for this stuff comes from the large and diverse Columbia Valley AVA. A serious Chenin with probably-serious aging potential, it’s a textural treat with both waxy and chalky characteristics, light plum-blossom and other “mixed bouquet” floral aromatics. A little hard to get (large tastiness and small production run usually equal “sold out” before long) but worth trying. Vouvray style, Washington juice. L’Ecole has been making Chenin Blanc since the late 80s, and I don’t think it’s going too far to say they’ve mastered it. Walla Walla Valley is a volcanic landscape that makes mineral-driven wines. This one’s crisp as a fall apple, and indeed tastes a bit like one, though the notes that hit you first are passionfruit and mandarin, as well as a light hint of lime blossom. There’s a teensy whisper of something kerosene-like (some people consider this a flaw, many emphatically do not; it comes from a compound called TDN that develops in the aging process). Basaltic finish. 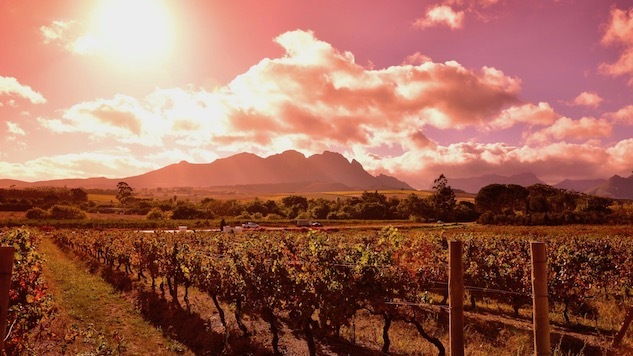 I admit my palate leans toward European wines but I need to put it on the record one more time: South Africa just might be the most pointlessly under the radar wine region in the world. This stuff can be had for ten bucks? C’mon. Greenish-gold in the glass, with a lithe, fruity approach (pineapple and peach come up for me). Firm but not aggressive acidity. There’s a delightful suppleness to this wine. Vivid, generous, bubbly personality (not literal bubbles!). Simple in a good way and a pleasure to drink. Sometimes I am a bit suspicious of wine brands that put so much focus on label design. This one, I have to conclude, is not hiding a vapid personality behind pretty make-up. It’s got really nice varietal typicity and no time whatsoever for pretentiousness. Honeysuckle nose, followed by notes of ripe oranges and Meyer lemon, nectarine mid-palate, crisp citrusy finish. Bouncy vivacious personality. If you are someone who takes himself very very seriously, please note this wine doesn’t do that so you might not get along. It’s playful, youthful and juicy. This wine came my way in an experimental box from firstleaf.com (more on that later). I have relatively little experience with California Chenins here in the land where Chard is king, so I was not sure what to expect. This is a very pleasant character with a high level of tropical notes versus temperate-zone orchard fruits-there is some pear to it but the dominant notes are lychee (common in CA Gewurtztraminer as well) and grapefruit zest with an overlay of honey. Mandarin-dominated palate. It has a creamy kind of texture with a mild salinity on the finish. This is a drag-and-drop food wine that you can pair with virtually anything; I might suggest salmon, or crab. But it’s not going to get argumentative whatever you’re having for dinner. Chenin blanc is a lot of things but combative isn’t one of them.